Enjoy Free Hors d'Oeuvres 3 Nights a Week at this Award Winning Hotel!Situated right off I-90, the Holiday Inn Express Coeur d'Alene hotel has the perfect location for easy access to nearby attractions.If you're looking for hotels near Lake Coeur d'Alene in Idaho, you've found it. We're also just minutes from Silverwood Theme Park where kids can find a variety of activities to entertain them. Adults can try their luck at Coeur d'Alene Casino or head over to the beautiful Coeur d'Alene Resort Golf Course to hit a few balls. There's something for everyone near our property. For our corporate travelers, we offer a Business Center with free copy and print services. In addition, Kootenai Health, North Idaho College, University of Idaho and Lewis & Clark State College are all close to our location in Coeur d'Alene, Idaho. 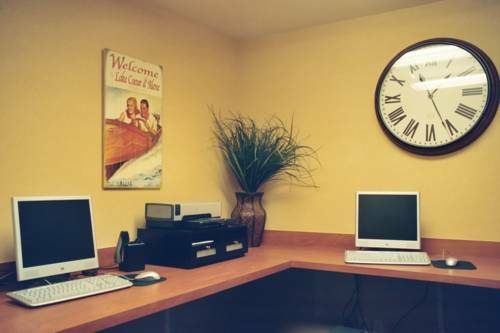 Our hotel's free high-speed, wireless Internet access makes it easy to conduct business from the comfort of your room.While staying with us in Coeur d'Alene, Idaho, our hotel's staff invite you to enjoy the great amenities. We offer a 24-hour Fitness Center, indoor pool and whirlpool. Every morning, we serve a complimentary, hot breakfast bar, featuring delicious Cinnabon rolls, fresh fruit, Smart Roast coffee and more. Don't forget about fresh baked cookies every night at 7pm. Make your reservation today. Outback Steakhouse: National Chain located less than a mile from the hotel. Great Steak and seafood in an Australian atmosphere including a full bar on site. Bardenays: Bardenays is a locally owned vodka distillery and restaurant. Situated in the Riverstone area, it is within half a mile of the hotel. This restaurant is a favorite of the hotel staff and locals. Childrens's program - In addition to the indoor pool & hot tub, we offer board games, lawn games, and books to enjoy that are available at the front desk. We also have a Wii gaming console, dvd players, and blue ray players available for checkout from the front desk. The Boardroom: Room can be arranged to any set-up you desire; 70'' High Definition TV capable of wireless connection to laptops. *If your group is in need of a larger Conference Space, we will help accommodate and coordinate your group at an off site local business. Silver Lake MallSilver Lake Mall has many stores including Macy's, JCPennys, Claires, and Bath & Body Works.There is also Target, Kohls, Best Buy, Petco, Ross, and numerous other shopping stores within a mile of the mall. Riverstone DevelopmentWalking distance behind hotel is great Boutique Shops, Bars, Restaurants, and Movie Theatre.